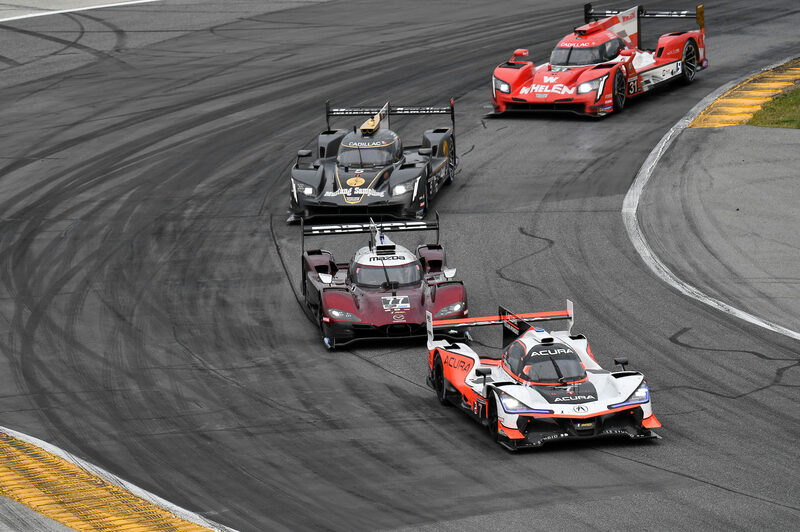 In the aftermath of the 2019 Rolex 24 At Daytona, there are a lot of story lines to tie a bow on. Here are some nuggets of notes from the week that has just passed. Konica Minolta Wayne Taylor Racing captured its fourth Rolex 24 win (1996, 2005, 2017). This is Jordan Taylor’s second (2017) while Renger van der Zande, Fernando Alonso and Kamui Kobayashi all have their first win. 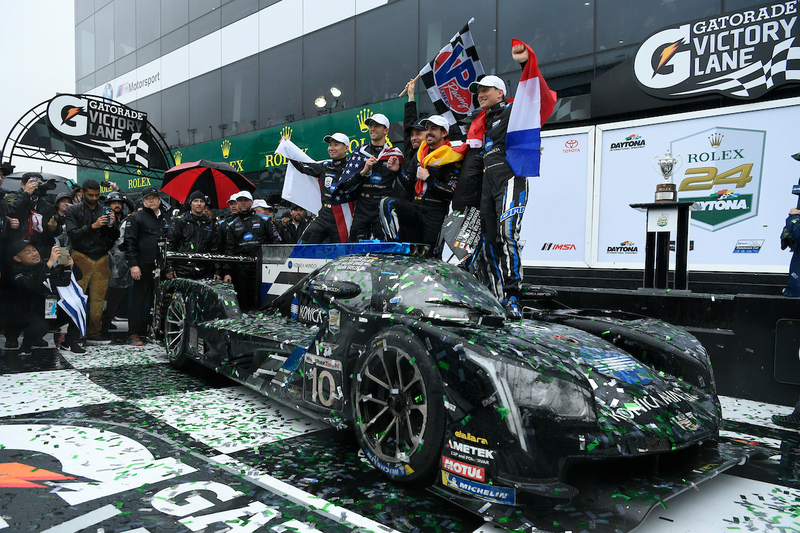 The Cadillac DPi-V.R extends its Rolex 24 record to a perfect three-for-three. Additionally, each win has been a 1-2 finish with an Action Express car second (No. 5 in 2017, No. 31 in 2018 and 2019). The No. 10 WTR and No. 31 Whelen Engineering Cadillacs combined to lead 356 of the 593 laps. In a strange note, the No. 5 Mustang Sampling Cadillac did not lead a lap. Acura Team Penske enjoyed a steady outing with the No. 6 ARX-05 leading 119 laps and the No. 7 car adding 78 more out front. 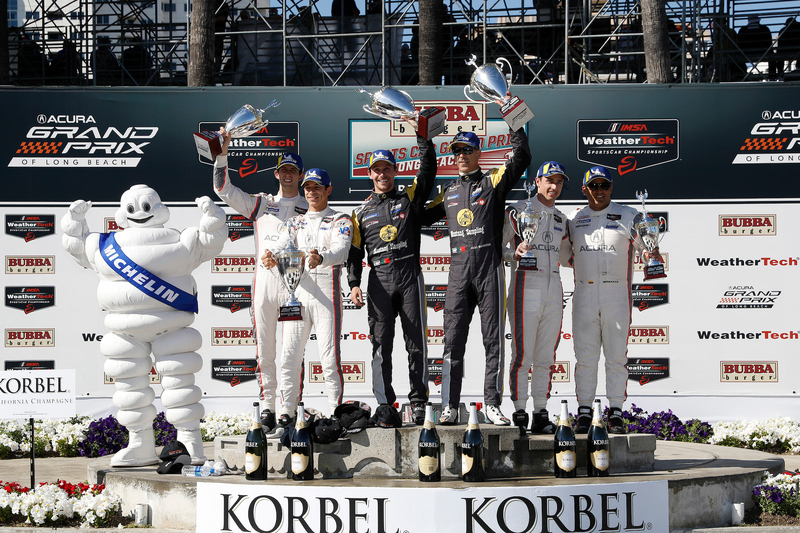 The latter car in the hands of Ricky Taylor, Helio Castroneves and Alexander Rossi rounded out the podium. CORE autosport enjoyed a strong debut with its new Nissan DPi, acquired late in the offseason from the Patron ESM team. The No. 54 car led two laps and finished fourth. JDC-Miller completed the top five with its No. 85 Cadillac, which included Rubens Barrichello as its notable extra driver. Mazda showed its pace and potential but yet again fell victim to mechanical woes, which halted both RT24-Ps. BMW’s win for its No. 25 M8 GTE came following several unanticipated bits of news in the run-up to the race, then surprises in the race. Connor De Phillippi’s planned full-season co-driver, Tom Blomqvist, was unable to race due to visa issues. Brazilian Augusto Farfus filled the spot. Then just before the race, longtime Schnitzer BMW team principal Charly Lamm passed unexpectedly. 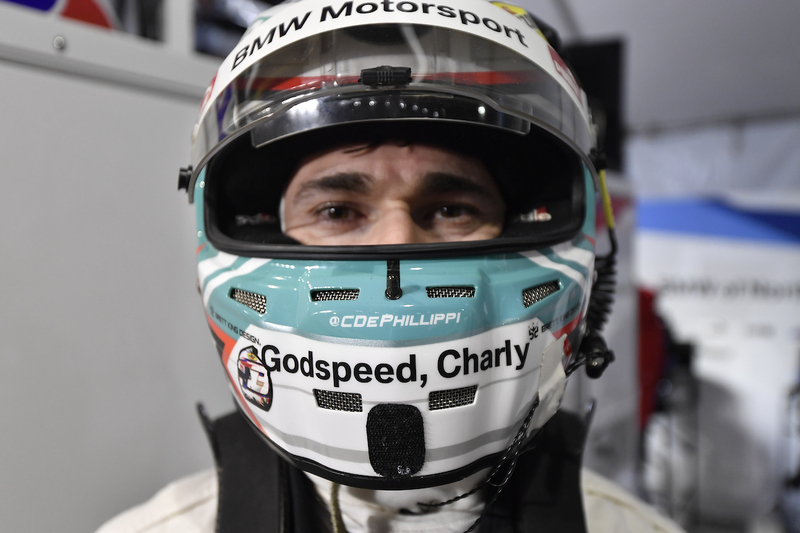 The team added “Godspeed, Charly” to its cars and helmets during the weekend. As for Farfus’ winning pass, it came with almost no visibility on the No. 62 Risi Ferrari heading into the Bus Stop. De Phillippi now adds a Rolex 24 win with BMW to the car’s first worldwide win last year at VIR. Philipp Eng and Colton Herta, the 18-year-old who set the fastest GTLM race lap, completed the lineup. Risi finished second with an all-factory lineup ahead of the first of the two Porsche 911 RSRs, the No. 912 car driven by Laurens Vanthoor, Earl Bamber and Mathieu Jaminet. Porsche dominated the class in dry conditions with over 260 laps led between the Nos. 911 and 912 cars, adorned in the special Brumos Racing historic livery. The two cars finished third and fifth. Ford could also afford to feel disappointed. A call to pit for emergency fuel triggered a penalty that dropped the No. 67 Ford GT down to fourth. The result followed a rally from early race contact on the pit wall and a stop-and-hold for an improper wave-by. This car overcame a five-lap deficit. The sister No. 66 car also re-entered the race following a 19-minute thrash by its crew to get it back out. That had to happen as with three hours and 45 minutes remaining, the No. 911 Porsche hit the rear of the then-leading No. 66 Ford in the treacherous conditions. Murphy’s Law seemed to apply to Corvette Racing. The two C7.Rs inadvertently hit each other in the pits. The No. 3 car had an electrical issue that compromised fuel monitoring. And the No. 4 car hydroplaned into the Turn 1 barrier, which forced repairs. The two cars finished sixth and eighth. Alex Zanardi’s race start didn’t go according to plan. BMW confirmed his car dropped off the air jacks on the stop, as Zanardi was pushing his steering wheel in place onto the column. As he couldn’t engage the wheel correctly, the column was damaged. This marked this first occurrence. Nonetheless he pressed on and posted laps on par with his teammates in the car, John Edwards, Jesse Krohn and Chaz Mostert. Smaller incidents resigned the car to ninth, but the team pressed on the entire race. The winning No. 11 GRT Lamborghini repeated its 2018 win, albeit with a slightly different driver lineup and an updated Evo car. Rolf Ineichen, Rik Breukers and Mirko Bortolotti repeated, while Christian Engelhart was in for Franck Perera. 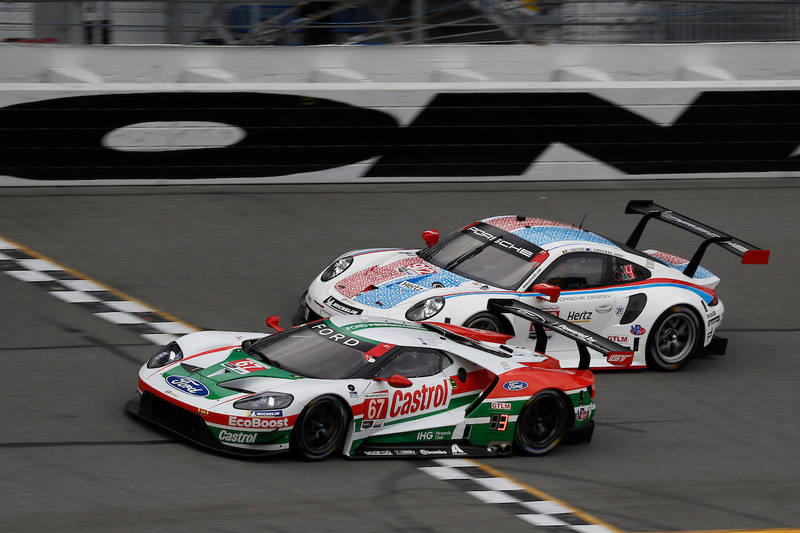 The GTD lead changed hands several times in the final moments of the race. Conditions forced the No. 29 Montaplast by Land Motorsport Audi and No. 33 Riley-AMG Mercedes off course and dropped them to second and seventh, respectively, on the road. However after the race, IMSA dinged Land and Scuderia Corsa for drive-time violations, and dropped them to 22nd and 23rd in class. Riley’s No. 33 Mercedes led a class-high 141 of 561 laps. That was the only car in class to lead more than 100 laps. No less than 16 of the 23 cars entered in class led at least one lap. AIM Vasser Sullivan debuted its new program with its two Lexus RC F GT3s and finishes of third and sixth in class, which became second and fifth after penalties. The lone all-American lineup of Townsend Bell, Frankie Montecalvo, Aaron Telitz and Jeff Segal claimed the final podium spot, courtesy in large part of Segal’s storming charge in the final hours. The two cars combined to lead 53 laps. Lexus was the only brand to place two cars in the top five. The WRT Speedstar Audi Canada finished fourth on the road and jumped to third following the Land penalty. 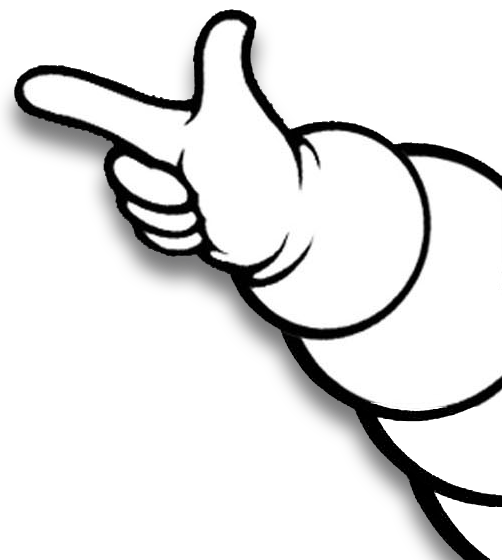 Roman de Angelis, Ian James, Frederic Vervisch and Kelvin van der Linde shared the No. 88 Audi that bore a maple leaf on its side. De Angelis even received a shout out on Twitter from Canadian Prime Minister Justin Trudeau. Ultimately Cameron Cassels (second in LMP2) was the race’s top finishing Canadian driver. Acura’s top finishing GTD car was the No. 86 Meyer Shank Racing with Curb-Agajanian, in fourth. Trent Hindman, Mario Farnbacher, Justin Marks and NBCSN commentator AJ Allmendinger were a consistent contender, and led 92 laps. Park Place Motorsports was the highest finishing of the four new Porsche 911 GT3 Rs in seventh. Like others in class, this team could afford to feel disappointed it wasn’t higher. Patrick Long, Patrick Lindsey, Nick Boulle and Matt Campbell shared the No. 73 car. Campbell was the designated Porsche factory extra driver here. In a rarity, Lindsey’s FIA WEC co-driver, Jorg Bergmeister, missed the Rolex 24 for the first time since 2001! The polesitting Via Italia Racing Ferrari finished eighth in class with the lone BMW in class from Turner Motorsport and Magnus Racing’s new Lamborghini completing the top 10. As all three cars led laps, it meant each of the top 10 finishers led at least once in this race. While GRT won, Magnus Racing (10th) and Paul Miller Racing (15th) both led but had results unrepresentative of their performance with their new Huracan Evos. Crash damage from a separate incident knocked the defending GTD champions, PMR, out of the race. The all-women lineup of Katherine Legge, Bia Figueiredo, Simona de Silvestro and Christina Nielsen finished 12th, following a trip to garage for repairs once the rain hit. 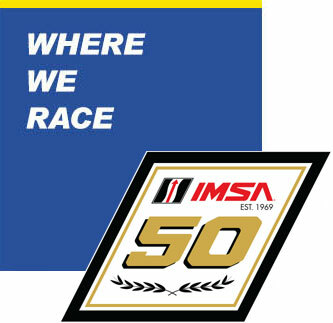 This marked the debut for this program under the newly rebranded Heinricher Racing with Meyer Shank Racing umbrella, owing to team principal Jackie Heinricher. The No. 57 Caterpillar Acura NSX GT3 Evo remained one of the major story lines during the entire month. 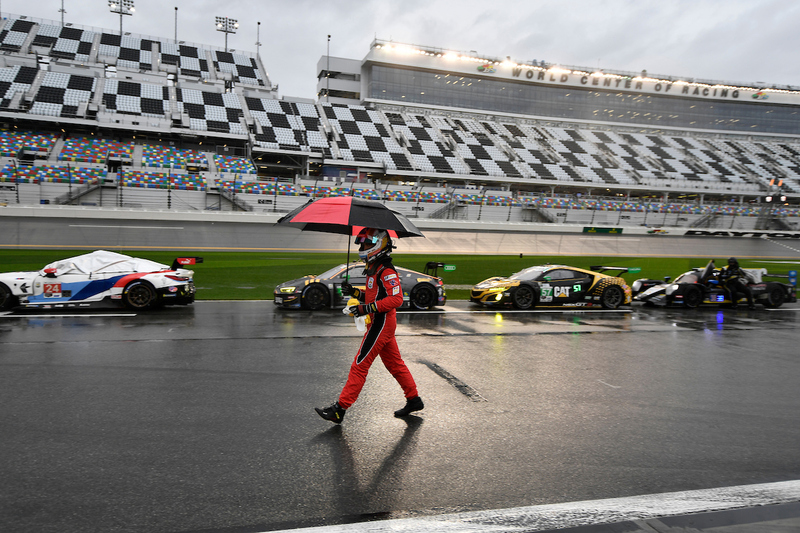 The rain and track conditions caused significant incidents for the Scuderia Corsa, Black Swan and PFAFF teams during the race. 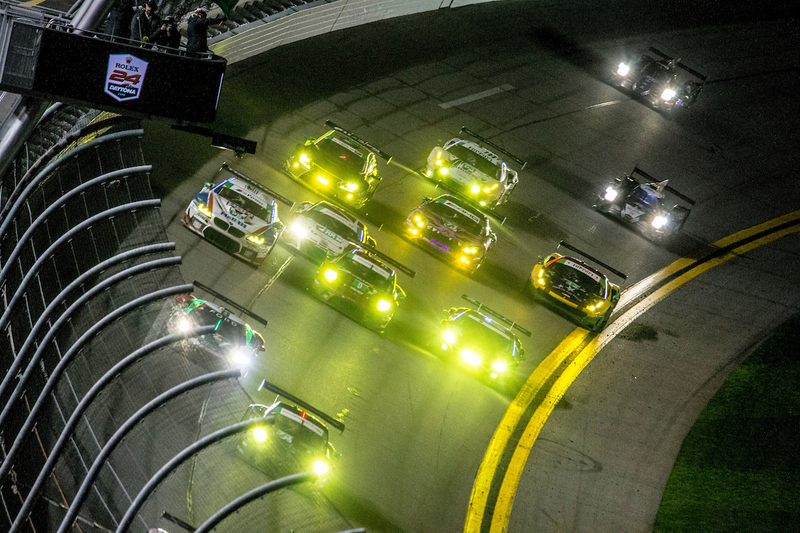 Starworks, P1 and Spirit of Race also led laps in GTD. A race of attrition saw DragonSpeed claim the class victory with its No. 18 Oreca 07. Pastor Maldonado, Sebastian Saavedra, Roberto Gonzalez and Ryan Cullen shared the winning car. They finished sixth overall. Saavedra had an incident which damaged the car and brought out the final yellow flag, which ultimately became a red flag. The team had a four-lap lead over second place. The Colombian called the car a “tank” as it pressed on despite several nose changes. Performance Tech Motorsports, the 2017 PC class winners at the Rolex 24, finished second in class, and seventh overall. Its lineup included the father and son pair of Dr. Robert and Kyle Masson with Kris Wright and Cameron Cassels. 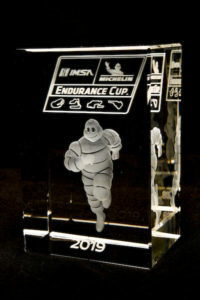 The renamed IMSA Michelin Endurance Cup premiered this race as well. However, the rain played an impact here too in terms of who finished where (IMEC results, Daytona). In both DPi and LMP2, the class-winning car was also the top scoring car over the four points-scoring stages in the Michelin Endurance Cup. Points are awarded at the six, 12, 18 and 24-hour intervals. Risi Competizione’s quartet was the top scoring GTLM team. James Calado, Davide Rigon, Alessandro Pier Guidi and Miguel Molina shared the No. 62 Ferrari 488 GTE. In GTD, there had been a tie between the Montaplast by Land Motorsport and Riley-Team AMG Mercedes squads on the road. However after the Land car’s post-race drive time penalty, the No. 33 Mercedes-AMG GT3 of Jeroen Bleekemolen, Ben Keating, Felipe Fraga and Luca Stolz is the top scoring GTD entry for this round. The rain’s impact on the race was evident in several years. Last year, there were four full-course cautions for 24 laps. This year, there were 17 cautions for 126 laps, and two red flags. This marked the first time there were two red flags in the event’s history. Christian Fittipaldi had an emotional good-bye to the race, as one of three drivers in the No. 5 Mustang Sampling Cadillac. 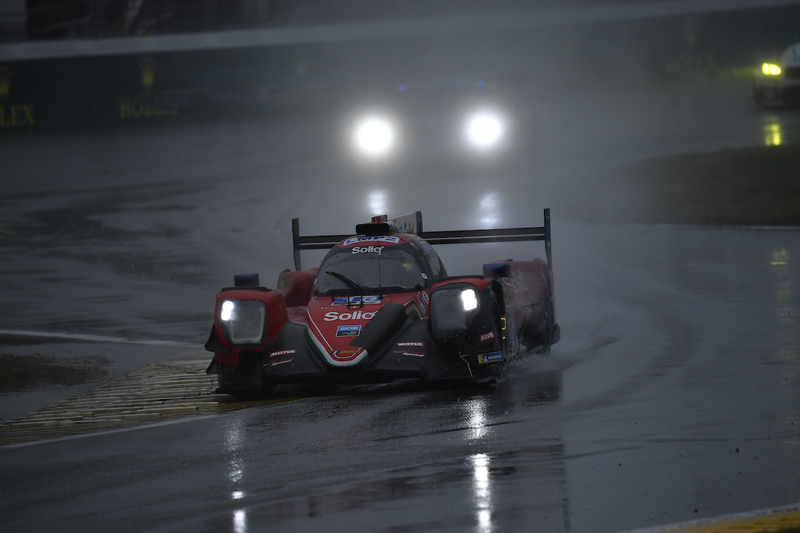 The Brazilian took on a heavier than anticipated workload as fourth driver Mike Conway had travel troubles getting to the track, and was unable to make it. Fittipaldi was honored all weekend, including during a surprise send-off party from friends after night practice on Thursday, and again by the media and fans on Sunday. 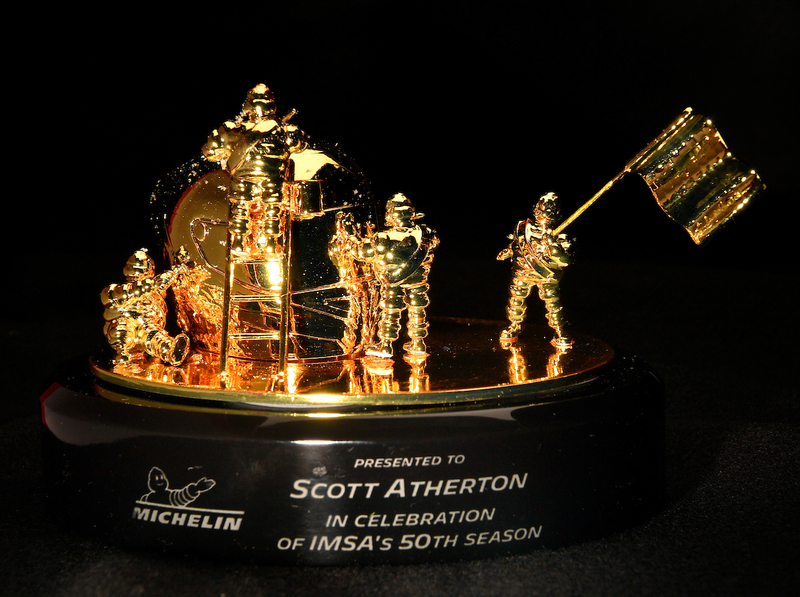 On Friday, Michelin awarded IMSA’s Scott Atherton, Ed Bennett and Jim France (France wasn’t able to attend) special commemorative trophies in honor of IMSA’s 50th Anniversary. The Torque Show was live in full force over the course of the weekend, as Justin Bell and Tommy Kendall premiered the new show with a number of standout guests. You can view full episode replays via the Motor Trend YouTube page here (Episode 1, Episode 2, Episode 3). Here is the first 2019 Michelin Tech Tip Minute courtesy of NBCSN. 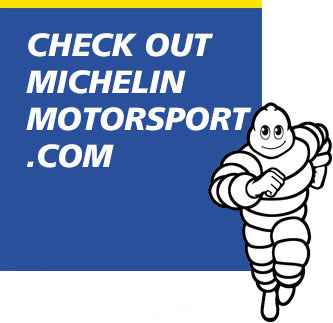 Jon Beekhuis explains Michelin’s logistical and operational increase for 2019 and speaks with Chris Baker, Director of Motorsport, Michelin North America.